Kirby is usually a series that appears later in the lifespan of a Nintendo platform, so you can imagine the surprise many gamers see themselves with as Kirby floats onto the Nintendo Switch just shy of the system's first year. Kirby: Star Allies doesn't stray too much from the formula that the series has established and has run on for a while, but like a sweet, delectable cake for Kirby, for me, Star Allies is nice comfort food -- though not without some small gripes here and there. This time around, this Kirby game's main selling point is its friend heart ability, where Kirby can chuck hearts at certain enemies to have them join his cause. 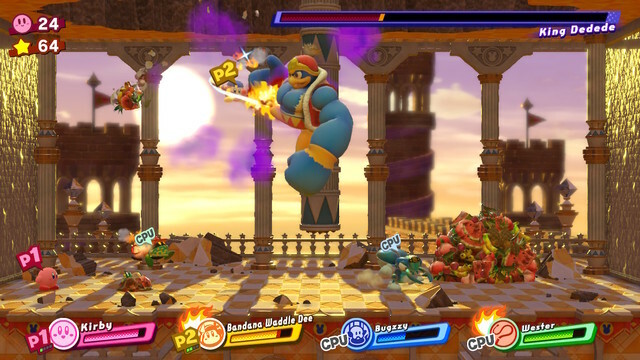 Up to four players can be on screen at once, including Kirby himself, and when the computer isn't controlling the other three helper characters, multiple human players can drop in and drop out at any time. With AI helpers, the game is a relatively easy experience, more so than it normally would be (as this Kirby installment is one of the less challenging ones), as the AI can solve puzzles by themselves for the most part as well as take down bosses without much of a sweat. It just takes some patience for them to whittle down a given boss's health bar. There is an abundance of helpers that Kirby can persuade to join his side of the fight, more than 25 in total. These are your standard Kirby enemies that would otherwise bestow Kirby with their abilities when gobbled up by the pink puffball through traditional methods. There are Sword, Cutter, Hammer, Ice, Fire, Bomb, Beam, Stone and even some new additions in the form of Artist (which attacks with a colorful paintbrush), Spider (which ensnares foes in webs and allows the ability to kick webbed opponents into other enemies), and Staff (which turns Kirby all Donatello from the Teenage Mutant Ninja Turtles on enemies). Most of the time you'll be switching between helpers like used Kleenex, as keeping the same batch of friends with the same abilities is frowned upon if you want to get all of the secrets within the game's many stages. Furthermore, taking a familiar page out of Kirby 64: The Crystal Shards, the ability to combine powers has returned, though it is slightly altered for Star Allies. When a player holds up on the control stick or D-Pad, they hold up an outline of a heart. If another player uses their copy ability power on that heart, their power will combine with that character's, if possible. For instance, a Sword ability user can have a Fire ability user lend their power to them, turning their ordinary Sword into a Sizzle Sword ability, able to not only slice and dice, but also set enemies and objects ablaze in the process. 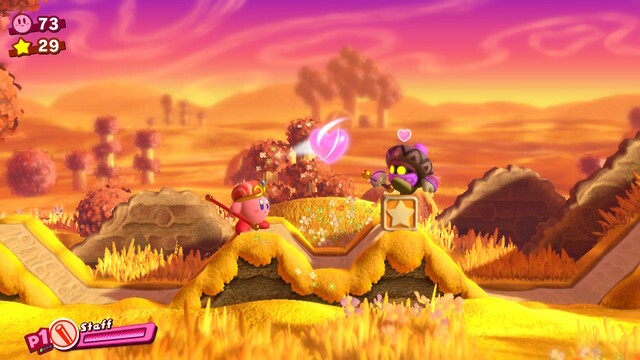 This combination of powers is necessary to solve some of the optional challenges within Kirby: Star Allies, such as being able to enter into the secret areas of the game off the beaten path. However, many times, Star Allies will provide players with the necessary combination of ally powers needed to progress or solve a particular puzzle or challenge via a signpost. It takes away most of the experimentation from players and instead makes puzzle rooms less of a puzzle and more of a "go through the motions" type experience, which, while understandable for younger gamers (which Kirby as a franchise is skewed towards), makes it disappointing all the same. There are only so many ways you can utilize the combination of Water and Stone abilities to solve a simple puzzle, and Kirby: Star Allies takes away the fun of solving such trials for yourself. 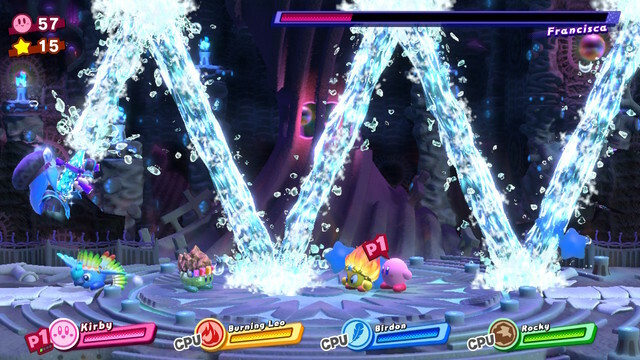 Outside of specific ally abilities like traditional Cutter, Sword, Bomb and the like, Kirby: Star Allies allow Kirby and his friends to team up in other ways through special transformation forms. Kirby and company can turn into a giant Friend Circle, rolling through enemies and obstructions with ease, or they can enter a Friend Train, choo-chooing their way along floors, walls, and ceilings as they defy gravity. Then, there is a less-exciting transformation, the Friend Bridge, which is used in small amounts for puzzles where you are tasked with safely sending an enemy with a key from one side of the bridge to the other. Unlike past recent mainline Kirby games, these transformations aren't the main focus of the game, and they don't interrupt the flow and pacing of Star Allies as much as things like Hypernova in Kirby: Triple Deluxe did, to name one example. They're most welcome and break up the traditional 2.5D platforming quite nicely in Star Allies. Kirby: Star Allies is comprised of four main worlds containing a wide variety of stages. Each stage contains a rainbow puzzle piece, which is usually placed in the "most challenging" (challenging is a relative term when we're talking about Star Allies) location within the level. These pieces fill up an assortment of jigsaw puzzles that reveal images from Kirby's illustrious history as a gaming icon. There are also regular puzzle pieces to collect in levels as well, but these don't fill in specific pieces of these jigsaw puzzles. 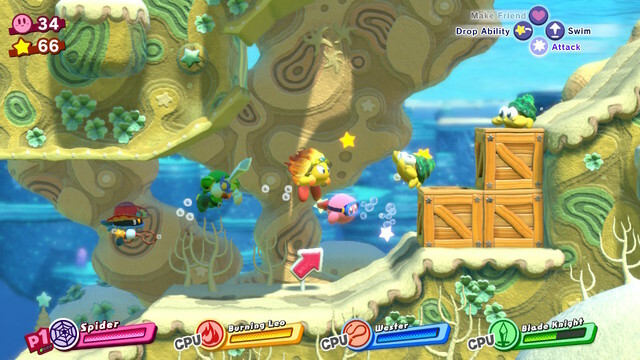 Additionally, some levels go the Kirby's Adventure route and house special switches that when pressed, unlock extra stages to play through, prolonging the entertaining story mode of Star Allies. In total, there are close to the same amount of stages in Kirby: Star Allies as other games in the series like the Wii's Return to Dream Land and the Nintendo 3DS's Triple Deluxe. The boss battles are highlights of Star Allies, and they have the pleasure of not just being isolated to the end of each world either. Instead, they can occur midway through a world, or even in the first stage of a world. It keeps players on their toes, and it simultaneously allows a much wider amount of battles to take place against foes both fresh and familiar (as well as new takes on old foes). While most bosses have simple patterns to pick up on and antics that won't overly challenge veteran players, the boss fights in Kirby: Star Allies are engrossing and enjoyable all the same. Outside of the story mode, which won't last terribly long (it clocked in for me around five hours or so), a host of other modes is available, including two quick throwaway mini-games, and some much more substantial and meaty modes which unlock after the initial story mode is finished. 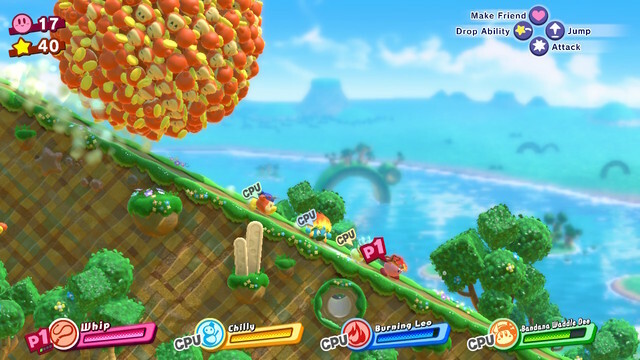 One mode allows you to play as any four helper characters, doing away with Kirby as the star, and having you go through a remixed collection of the story mode's stages. If you like, you can play this mode as each of the different helper characters (though this isn't necessary in earning 100% completion on a save file), including special Dream Friends like Bandanna Waddle Dee, King Dedede, Metaknight, and even some free downloadable characters from past Kirby games like Kirby Dream Land 2's Rick, Kine, and Coo, or Kirby Super Star's Marx. Another mode that unlocks is a special boss rush mode. Depending on which difficulty you choose, there are more rounds to take on, less food items to restore your health between rounds, and much more dangerous and deadly foes. While Kirby: Star Allies is overall an extremely breezy game to beat, this substitute mode for the Arena mode of past Kirby games is quite the challenge. To beat the ultimate difficulty level of Kirby: Star Allies's boss rush mode is something to definitely be proud of. Kirby: Star Allies is one of the only console Kirby games that runs at 30 FPS instead of the typical 60. However, this doesn't really detract heavily from the gameplay experience, and I got used to it rather quickly. What is more jarring is the plethora of loading screens that occurs between room transitions in Star Allies, something never-before-seen in a Kirby game, to my recollection. While these loading screens are fast and present players with helpful tips and advice, they do add up over time. Star Allies is a positively pretty game to look at. The backgrounds and environments are an absolute pleasure to gaze upon, and I sometimes found myself just stopping to admire the scenery on many occasions during my playthroughs of the game. Character models look exquisite and are wonderfully animated to create a world in Kirby: Star Allies that is detailed and lovely on the visual front. On the sound side, Star Allies features both new arrangements of classic themes from past Kirby games as well as wholly new compositions. Whether it's the trademark melody of the Green Greens theme or the more electronic sounds of the Jambaston fortress, the music is marvelous in Star Allies. Kirby: Star Allies doesn't do much to push the formula of the franchise forward, but it does successfully craft a game that is well worth playing for both solo gamers and those with the ability to play with multiple people. The low difficulty of the game, even compared to past Kirby entries, will be a turnoff for some players (even the locations of secrets aren't anywhere near as diabolical as past Kirby games). However, there is enough in this pink puffball package to engorge oneself on and enjoy. It's not a truly fantastic Kirby game, but Kirby: Star Allies does its job of providing a highly competent and capable Kirby game for Nintendo Switch owners.